The first stage being the group stage or the qualifying stage. The teams are broken up into 8 groups/pools lettered A through H, with each one of the groups having 4 teams. Each group will play a Round Robin Tournament, which simply means each team in a group will play the other 3 teams in that group 1 time. Here is the 2018 World Cup Group Stage Schedule. There is also a consolation game to decide 3rd and 4th place. For dates and schedule of the tournament check out When does the World Cup Start article. 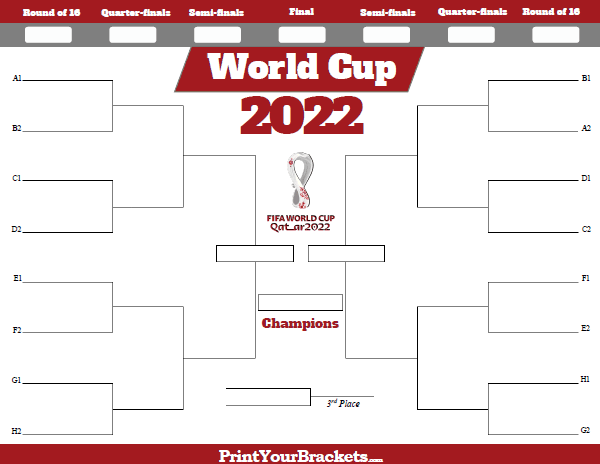 Distribute the bracket to family, friends, and coworkers having them fill out the bracket with they teams they think will advance through the bracket. Be sure all brackets are turned in before the first game. There should be a tie-breaker in place, in case two or more participants have the same point total at the end of the tournament. For this pool I like to use the total goals scored in the entire tournament. For other unique office pools try our World Cup 100 Square Grid, our World Cup Tournament Squares Pool, our World Cup Survivor Pool and our World Cup Confidence Pool.